So - what do you need to know to get started? While it is true that you can use any windsurfing board with a deep tuttle box (or even a power box with an adapter) with a foil, you may not want to. Compared to a normal fin, a foil puts a lot more stress on the fin box and your non-foiling board may not hold up. There are two main categories of boards that are designed to be used with foils. There are actual foil boards that are designed to be optimized to foiling. 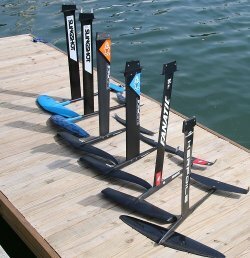 Boards like the Starboard Foil 122, Slingshot Wizards and Dialers, and the Exocet RF Foil have a distinctive design with short lengths and lots of width (especially in the tail). A dedicated foil board has more volume in the tail to support your weight as you move back before getting to foiling speed. They are shorter to reduce windage and swing weight - and the benefit is noticeable. Bevels are cut in rails in the front to help keep you upright when you come down off the foil. We have found that it is easier to get foiling in lighter winds with a dedicated foil board - that is what they are optimized for. The other option is a more traditional windsurfing board that has a foil box (like a deep tuttle fin box, but super reinforced). In this category you have the Fanatic Lightwind, Fanatic Gecko and Blast Foil editions, Starboard Carve IQ Flax Balsa as well as the larger sizes of Starboard Isonics and Fanatic Falcons. With any of these, when it gets windier than what you want for foiling, you have the advantage of pulling the foil out and putting the traditional fin in so you can have a blast windsurfing around like you are used to. Sails are more universal when it comes to foiling - but if you want to maximize super light-wind performance a foiling specific sail like the Sailworks Flyer will help. We have been foiling with freestyle sails, wave sails, and freeride sails - they all work! As always, a light-weight rig is more fun to use and you will appreciate it when you are uphauling (you can foil in significantly less wind than you can water start in). Foils come in a lot of different configurations! Some are full carbon construction, some aluminum, and some are a combination of carbon and aluminum. There are foils that are primarily for very light wind and foils that are designed to go fast. We can help you pick the foil that work best for you, the conditions you are going to be using it in, and the board you will be using it with! 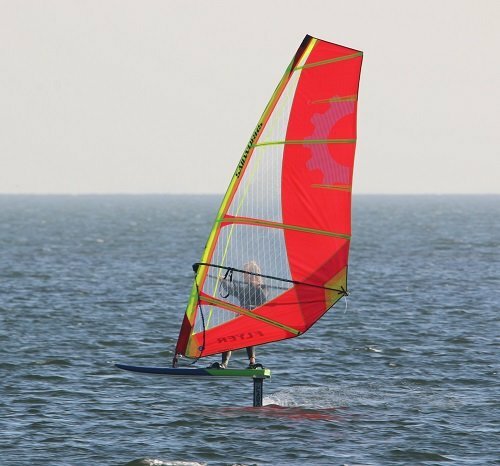 Foiling technique is very similar to windsurfing in flat water. Because there is not usually waves or chop to contend with in light wind, your body will be very straight from the ankles to the head. Lighter wind and lower board speeds mean there is not very much pressure in the sail compared to being lit up while windsurfing on the fin, so you body and the sail can be more upright until your board speed increases and you can begin to lean out more. To get the board foiling you start moving back on the board sooner than you might be used to. With some practice you can feel the lift from the foil and move back accordingly. When you feel upward pressure or lift from the foil, you push down on your back foot as your front foot goes in the front footstrap and board comes out of the water and onto the foil. Keeping the board up on the foil requires you to really keep the board flat and your body still. 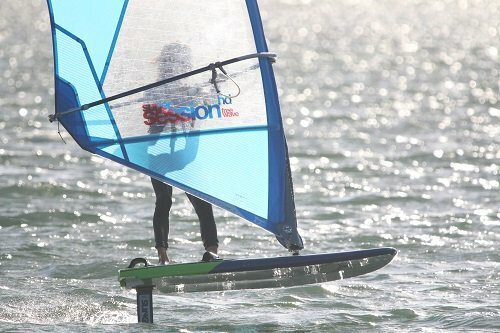 If you are used to windsurfing with lots of weight on your heels - it will be quite difficult to keep the board flying on the foil! But the crashes aren’t bad. The sail isn’t as loaded up as it is when you are normally blasting around, so you just tip over. The time spent learning is fun, and it is well worth it when you get it. The noise of the board on the water goes away and you get the amazing feeling of floating/flying above the surface of the water. If you want help getting started, we teach foiling lessons and rent foiling gear. In no time at all you can be foiling across Tampa Bay having a blast! If you are windsurfing in the harness and foot straps, you will be able to get foiling pretty quickly. Your first time out you will just be getting the feel of getting up on the foil and keeping the board level. Don't worry about the crashes. Because you can foil in light wind the sail doesn't have a lot of power, the crashes are easier than what you remember from learning to use the harness. On your first day foiling, be prepared to be in the water more than you might be used to! Because you can foil in light wind, you will be uphauling the sail to get going (you can foil in much less wind than you can waterstart in). Falling down and uphauling doesn't mean you are failing - it means you are learning. Dress for being in the water a bit more than usual and be prepared to be out of the harness most of the time on your first day. Foiling lessons are available all year long, 7 days a week - just give us a call at 727.656.659 or send us an e-mail to schedule yours!